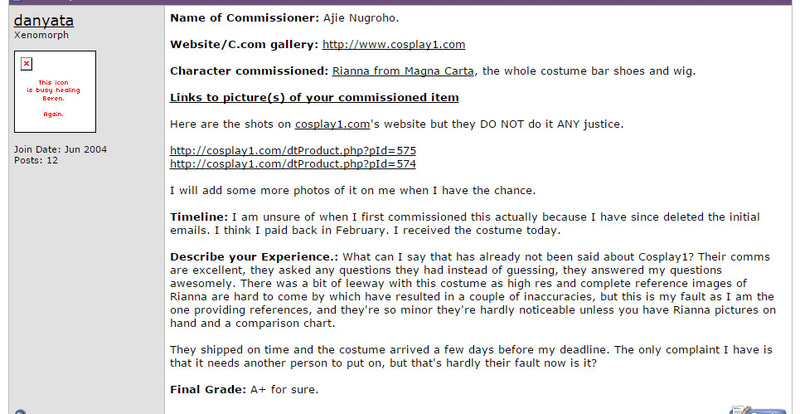 This is a Testimonial for our Cosplay Costume Shops. Name of Commissioner: Ajie Nugroho. Character commissioned: Rianna from Magna Carta, the whole costume bar shoes and wig. Here are the shots on cosplay1.com‘s website but they DO NOT do it ANY justice. I will add some more photos of it on me when I have the chance. Timeline: I am unsure of when I first commissioned this actually because I have since deleted the initial emails. I think I paid back in February. I received the costume today. Describe your Experience. : What can I say that has already not been said about Cosplay1? Their comms are excellent, they asked any questions they had instead of guessing, they answered my questions awesomely. There was a bit of leeway with this costume as high res and complete reference images of Rianna are hard to come by which have resulted in a couple of inaccuracies, but this is my fault as I am the one providing references, and they’re so minor they’re hardly noticeable unless you have Rianna pictures on hand and a comparison chart. They shipped on time and the costume arrived a few days before my deadline. The only complaint I have is that it needs another person to put on, but that’s hardly their fault now is it? Final Grade: A+ for sure. Create your own review about our Cosplay Costume Shop? Please order from us first.